Kefalonia Greece Wines Of Kefalonia. 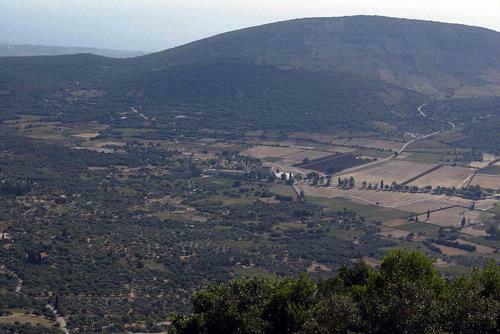 The Omala Valley is where much of the wine production takes place on Kefalonia. A total of around 48 varieties of grape are grown on the island producing a variety of wine. The most famous is the Robolo of Kefalonia, which is an aromatic white wine of superior quality. It has been granted its own Appellation of Superior quality wine (VQPRD) . The island has two other appellations which are Mavrodaphne and Moschato of Kefalonia . The slopes of Mount Ainos in the Omala valley. Mantzavination on the Paliki peninsular. This abundance of variety is due to the microclimates and soil types existing of Kefalonia which give the wines their special and unique characteristics. The local winemakers have been successful in international wine competitions and a number of awards have been won. In recent years much progress has been made in organic grape growing and wine production. The following is list of vineyards which open their doors for visits and wine tastings. The Agricultural Co-operative of Robola of Kefalonia Grape Growers. Omala, Tel.26710 86301, or 26710 86481. Open daily from April to October 9AM to 8-30PM. Divono Winery at Minies , near the airport. Open daily 10-00AM to 8-00PM. Sclavos Winery at Kechriona, Lixouri. Open daily from 10-00 to 2-00PM and 6-00PM to 8-00PM.